A corn or callus is an area of thickened skin that forms at pressure points over bony areas of your foot. 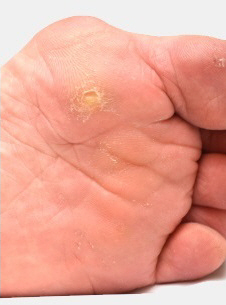 Too much pressure, usually with some friction, causes a corn or callus. So the skin thickens up to protect itself from the pressure. Corns and calluses are two of the most common problems that podiatrists see. The symptoms depend on where they are. problems with the way you walk (called a gait abnormality) or hold your body (called a biomechanical abnormality). A corn is a cone-shaped mass of skin pointing down into your foot. A callus is a dispersed, or wider, area of thickened skin that does not have a centre like a corn. There are two main types of corns. Hard corns are the most common. They are concentrated areas of dry and hardened skin and often happen on your little toe. They are sometimes called digital corns. Soft corns are white and rubbery. They can be extremely painful and tend to develop between your toes. Corns can become infected and develop ulcers. This can be a serious complication for people with poor circulation, peripheral neuropathy and those who need special diabetes foot care. You should never try to cut out a corn yourself, as you are likely to cut into your flesh and cause an infection. However, there are things you can do to help relieve the symptoms. Use a pumice stone or a foot file to rub away the thickened skin, a little at a time. Do this after you have soaked your foot in the bath for about 20 minutes, so your skin is softer. If you have diabetes, check with your podiatrist first if it is okay for you to do this. Make sure you don't mistake a verruca for a corn. If you file a verruca, it can spread to other parts of your foot. Buy foam or silicone wedges to help relieve the pressure if the corn is between your toes. Wear supportive shoes with a wide toe and a low heel. If you have poor circulation or a long-term medical condition like diabetes or rheumatoid arthritis, it's not a good idea to use corn caps. This is because if you have frail skin or poor circulation, corn caps are very likely to cause an ulcer, which could become infected. Your podiatrist will need to work out what is causing your corn or callus and what is the best way to manage it. If you have diabetes or poor circulation it is especially important to see a podiatrist. surgical correction of the bony area that may be causing the high pressure. In Canterbury, it costs from $45 to $90 for a first consultation and treatment with a private podiatrist. Orthotics can vary from $75 to $500, depending on the clinic and the type of orthotic used. Information about corns and calluses and how to prevent them. This brochure describes corns and calluses and their causes, and includes prevention information. This page outlines the causes of corns and calluses and common treatments. The language on this website is more technical than the above sites, however, this page has useful photographs of corns and calluses. Written by Canterbury podiatrists. Adapted by HealthInfo clinical advisers. Page created April 2016.